An original letter of correspondence between brothers and business partners Joshua Coffin Chase and Sydney Octavius Chase. Topics discussed in the letter include the sale of Isleworth oranges to G. Angelo of Boston, Angelo's claim of 10 percent decay during shipment, the possible legitimacy of his claim, the low quality of the coloring process of oranges and tangerines at Isleworth Grove, and plans for the brothers to visit the grove. Chase & Company was established by Joshua Chase and his brother Sydney in 1884. The company sold insurance and later invested in storage facilities and fertilizer sales. Chase & Company was known mainly for its agricultural interests and maintained a series of citrus groves throughout Central Florida. The company was based out of Sanford and became one of the city's largest employers into the early twentieth century. By 1886, the Chase brothers purchased several citrus groves to expand their business, including Isleworth Grove. Isleworth Grove covered a total of 1,300 acres along the Butler Chain of Lakes. Randall Chase joined in the family business soon after his brother, Sydney Chase, Jr., did in 1922. Randall became the president of Chase & Company from 1948-1965. The Isleworth property stayed in the Chase family until 1984 when Franklin Chase, the son of Sydney Chase, sold the property to famed golfer Arnold Palmer. Original letter from Joshua Coffin Chase to Sydney Octavius Chase, December 8, 1927: box 49, folder 20.84, Chase Collection (MS 14), Special and Area Studies Collections, George A. Smathers Libraries, University of Florida, Gainesville, Florida. 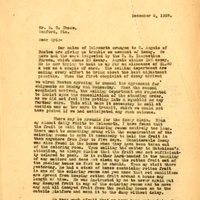 Digital reproduction of original letter from Joshua Coffin Chase to Sydney Octavius Chase, December 8, 1927. Chase Collection (MS 14), box 49, folder 20.84, Special and Area Studies Collections, George A. Smathers Libraries, University of Florida, Gainesville, Florida. Isleworth Collection, Citrus Collection, Chase Collection, RICHES of Central Florida. Folder referenced in Chase Collection finding guide, http://web.uflib.ufl.edu/spec/pkyonge/chase.htm. Entire Chase Collection is comprised of four separate accessions from various donors, including Cecilia Johnson, the granddaughter of Joshua Coffin Chase, and the children of Randall Chase. The displayed collection item is housed at Special and Area Studies Collections at the University of Florida in Gainesville, Florida. Rights to this item belong to the said institution, and therefore inquiries about the item should be directed there. RICHES of Central Florida has obtained permission from Special and Area Studies Collections at the University of Florida to display this item for educational purposes only. Warner, S.C. "Development of Marketing Citrus Fruits in Florida." Florida State Horticultural Society vol. 36 (1923): 198-200. Hopkins, James T. Fifty Years of Citrus, the Florida Citrus Exchange: 1909-1959. Gainesville, Florida: University of Florida Press: 1960. "Joshua Coffin Chase (1858-1948)." Florida Citrus Hall of Fame. Copyright 2012. http://floridacitrushalloffame.com/index.php/inductees/inductee-name/?ref_cID=89&bID=0&dd_asId=960. "Sydney Chase Sr. (1860-1941)." Florida Citrus Hall of Fame. Copyright 2012. http://floridacitrushalloffame.com/index.php/inductees/inductee-name/?ref_cID=89&bID=0&dd_asId=600. Chase, Joshua Coffin. “Letter from Joshua Coffin Chase to Sydney Octavius Chasee (December 8, 1927).” RICHES of Central Florida accessed April 26, 2019, https://richesmi.cah.ucf.edu/omeka/items/show/2708.